Thomas S. Monson, president of The Church of Jesus Christ of Latter-day Saints, died late Tuesday, the church said in a statement. He was 90. Monson had served as president of the Mormon church since 2008. "To the more than 16 million members of the church around the world, President Monson was an example of one who followed Jesus Christ," the statement said. It added that Monson died at his home in Salt Lake City. The next president was not immediately named, but the job is expected to go to next longest-tenured member of the church's governing Quorum of the Twelve Apostles, 93-year-old Russell M. Nelson, per church protocol, according to the Associated Press. Monson, who spent 45 years as an apostle, was known for making personal visits to homes or hospital bedsides or taking time to write a letter or make a telephone call, the church said in a tribute on its website. His name forever will be linked to compassionate endeavors, service to others," it said. Membership of the religion swelled to nearly 15.9 million during his tenure, with more than half outside the United States. He was viewed as a steady hand at a time when the church came under scrutiny during the 2008 and 2012 presidential campaigns of Mormon Mitt Romney. "President Monson always seemed more interested in what we do with our religion rather than in what we believe," Armand Mauss, a retired professor of sociology and religious studies at Washington State University, told the AP. However, the church supported a measure to ban gay marriage in California in 2008, prompting a backlash that included vandalism of buildings and demonstrations outside church temples nationwide. 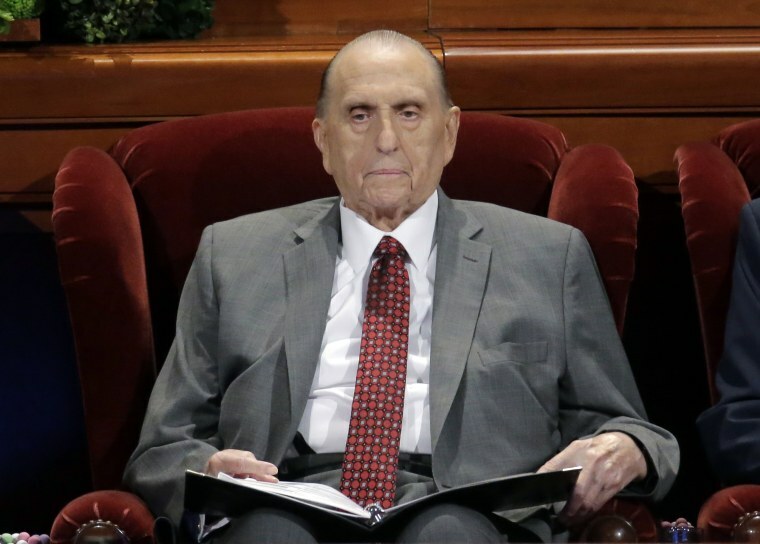 Monson's biggest change to the church was lowering the age of full-time missionaries in 2012 in order to boost enrolments from younger men and women, according to the Salt Lake City Tribune. It hailed Monson as an "affable leader, folksy preacher and care-taking friend." Monson was also an ardent football fan, NBC affiliate KSL reported, particularly of the University of Michigan Wolverines.